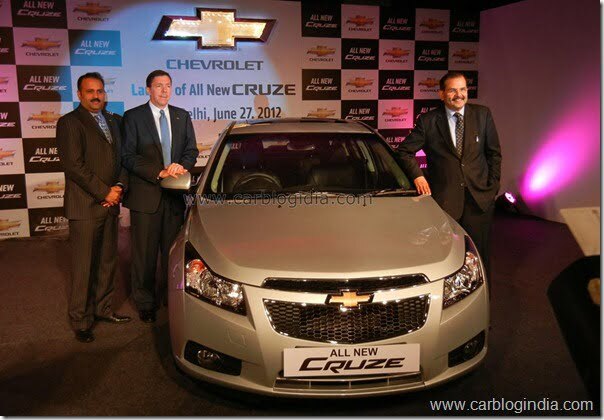 Chevrolet India has updated the Chevrolet Cruze to attract customers in festive season. The ‘all new’ Cruze gets some minor cosmetic changes on the outside, and minimal features on the inside. 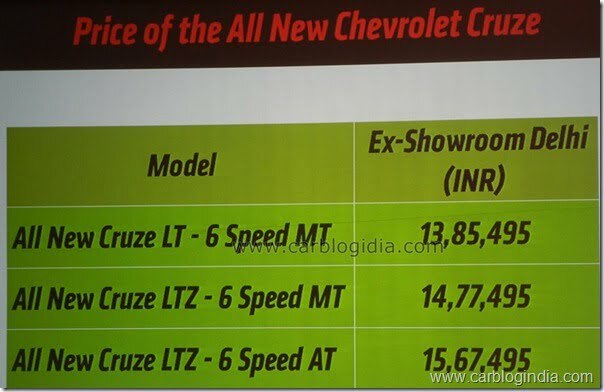 Chevrolet has also decided to revise the prices of the Cruze facelift too, while the lower end LT manual will cost a bit less, the higher end LTZ (both manual and automatic) will cost a bit more than the 2012 facelift. The increase in price can be attributed to the addition of features to these variants. No changes have been made to the engine, transmission or any other mechanicals on-board. The Chevrolet Cruze is still powered by a 2.0-litre diesel engine which produces 164 BHP @ 3800 rpm and 380 Nm @ 2000 rpm, the power is transmitted to the front wheels through either a 6-speed manual transmission or a 6-speed automatic transmission. There are no changes on the inside. On the features front the LTZ variant (MT and AT) gets side airbags at the front, bringing the total number of airbags in the car to 4, earlier it only has dual front airbags. The LT variant still has to make do with dual front airbags. Chevrolet Korea has recently unveiled the new 2013 Chevrolet Cruze in Korea and as per the expectations of buyers, media and dealers, the same model was expected to make it to India in 2012. 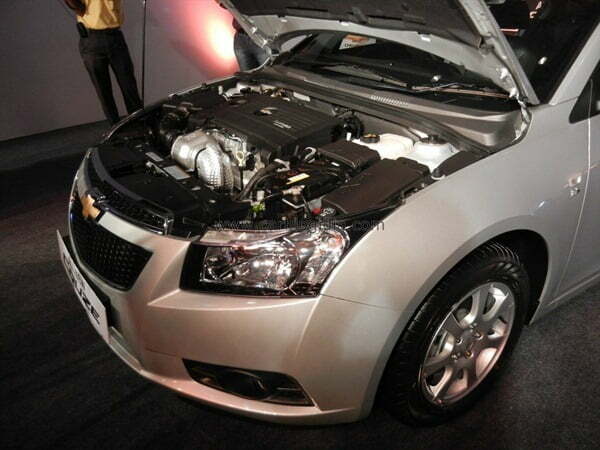 But against the expectations, Chevrolet (General Motors) India has decided otherwise. 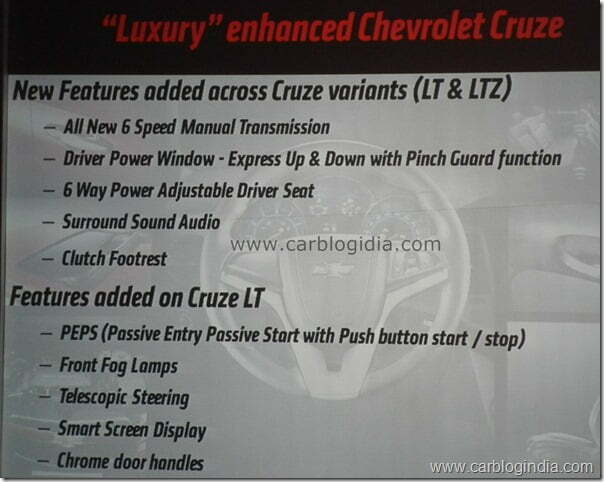 They have take a middle way by bringing performance upgrades with a new improved engine and minor feature changes in the 2012 Chevrolet Cruze India but they have not brought the facelift or the new visual elements of the 2013 New Chevrolet Cruze to India. Many potential buyers may feel disappointed by it, but the car still has a strong case in its favour as it is still one of the most value for money offering in the segment considering the features, power, performance and space. 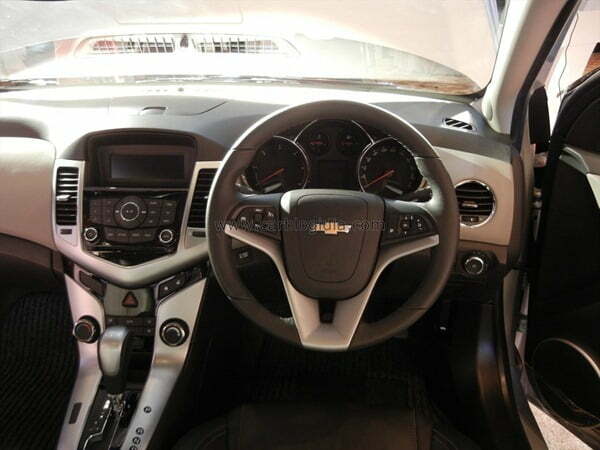 The interiors of the Cruze are already very high quality and the feature set is also quite impressive which makes it a preferred choice even without the expected facelift or cosmetic upgrades on the exteriors. 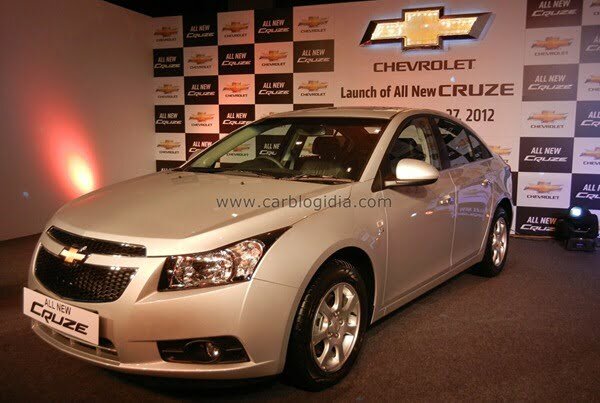 The New Chevrolet Cruze 2012 has been priced between Rs. 13.85 Lakhs to 15.67 Lakhs. 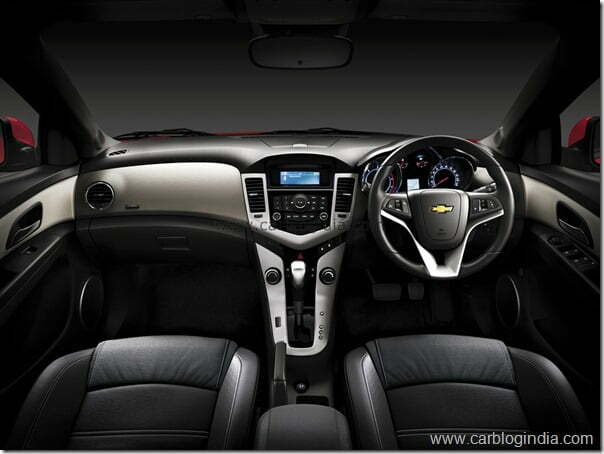 What Is New In 2012 Chevrolet Cruze India? Now lets talks about what has changed – the major change is the performance change with a much improved engines. The displacement of the engine has not gone up drastically, rather the new engine is also a 2 litre VCDi Diesel units but it is a new generation engine with lots of improvements which translated into more power, torque, refinement and lower turbo lag which improves the drivability to great extent. The new 2012 Chevrolet Cruze gets a 1998 CC new generation VCDi engine with Dual Overhead Camshaft (DOHC) mechanism for improved control of engine valve timings. The position of the variable geometry turbocharger has been changed inside the engine compartment to provide better thermal efficiency. The engine and engine mounts have also been strengthened coupled with higher injector pressure in the engine to provide lower NVH levels which makes the engine feel more refined and cuts vibrations. With improved engine configuration, tuning, DOCH valve train and overall improvements, the total power output of the new engine is 166BHP @ 3800 RPM and peak torque output is 380 Nm @ 2000 RPM. The older engine delivered 150 BHP @ 4000 RPM and 327 BHP @ 2600 RPM. In absolute terms, this is about 11% improvement in power and 16% improvement in torque, but more significant facts is that the peak torque is delivered at much lower RPM of 2000 compared to 2600 which makes the car much easier to drive in slow traffic without much gearshifts and revving, this improves the drivability quite significantly. The 2012 Chevrolet Cruze also gets a 6 speed manual transmission compared to the previous 5 speed transmission option, the automatic variant is still coupled to a 6 speed automatic gearbox but with tweaked gear ratios to suit the new engine’s output levels. The dimensions of the car has not been changed at all and the exteriors look exactly the same as the previous model. The kerb weight of the car has gone up by a minor 17 Kg. There are no major changes in the dynamics of the car, there is minor suspensions adjustment but its almost negligible.